I will not rest until I procure the advanced weapons needed to hit back at [President] Assad and his allies. … I give myself one month to achieve what I am intent to do. The new President made the comments to Reuters on return from Idlib Province in northern Syria, where he met commanders of insurgent brigades. Al-Jarba’s comments follow weeks of tension between the US and Saudi Arabia over supply of heavy weapons to insurgents. Washington said last week that it would support overt provision of arms, but ruled out anti-tank and anti-aircraft weapons as well as any no-fly zone. Disputes over which insurgents should receive the weapons, the objective of the military campaign, and logistics meant that few weapons have been sent from the multi-national centre in Jordan, where the US appears to have the lead role. However, significant amounts of arms — mainly from the Saudi — appear to have reached the insurgents across the Turkish border. Those supplies include anti-tank weapons. We are pushing in this direction. I think the situation is better than before. I think these weapons will arrive to Syria soon. My priority (is) to secure two-tier support for the Syrian people: military and humanitarian. We are working on getting advanced and medium-range weapons to the Free Syrian army and the liberated areas. Al-Jarba offered a truce for the Muslim holy month of Ramadan, which begins on Tuesday, particularly to stop fighting in Syria’s third city of Homs. 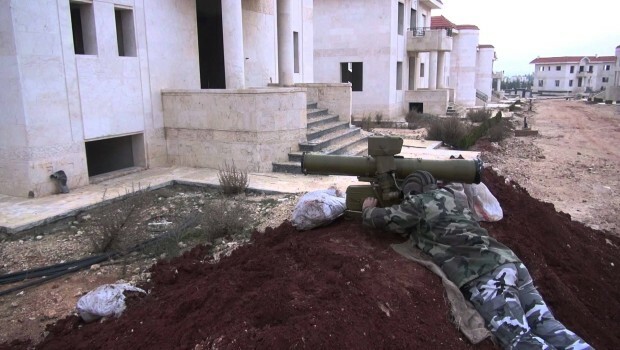 Regime forces have been bombarding insurgent-held sections of the city for the weeks, trying to establish complete control over a city they declared “liberated” 16 months ago. “We are staring at a real humanitarian disaster in Homs. Assad, whose military machine was on the verge of defeat, became propped up by Iran and its Hezbollah proxy,” al-Jarba said.